There’s one night left until the big day…..that is Election Day – and of course the launch of new premises for Hale Compound Conditioning. But first things first….only two things to remember. It’s not that hard. But according to the 2014 statistics it was a fact of life that eluded 214,000 New Zealanders, aged between 18 to 29 years. You can enrol to vote any time up until Friday night. You can do that at an early voting place and then vote - or you can enrol online: see link here: http://onthefence.co.nz/ . Voting is going on now, and closes this Saturday at 7pm. I had the most wonderful weekend, attending Te Whare Tu, Te Whare Ora, an annual community event that Nga Kete Matauranga Pounamu facilitates at the Invercargill Working Men’s Club. Daniel and Leoma Tawaroa, from the Maori Public Health Team at Nga Kete, convened the event to endorse prevention and health promotion approaches in the context of All Age Suicide Prevention. 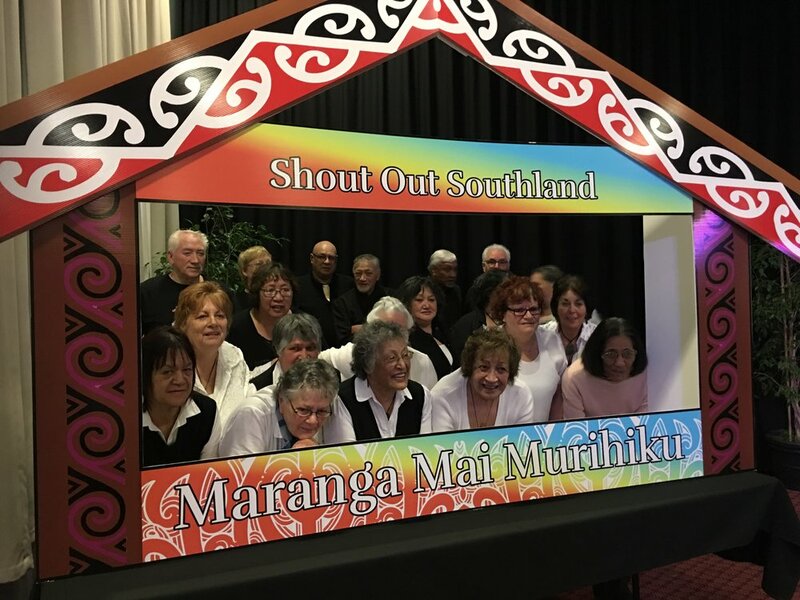 The concept is to promote that whānau stand together to support others in need or at risk – Shout Out Southland – it’s about how to have courageous conversations that enable others to seek assistance. The People’s Award for kapa of the day was won by Oraka Aparima Runaka. It was an amazing day of talent – both at kapa haka level and in the wonderful launch of the Ties That Bind Us: a project Te Pūtahitanga o Te Waipounamu had invested in as part of our Anahera funding (seed funding). While we are down South, here’s a great story about the third Hikoi Te Hauora Addiction Recovery Camp held in the beautiful Blackmount Valley at Te Koawa Turoa o Takitimu. The popular camp aimed to maintain and sustain recovery from alcohol and drug addiction was held at the beginning of September, with participants rating it 10/10. 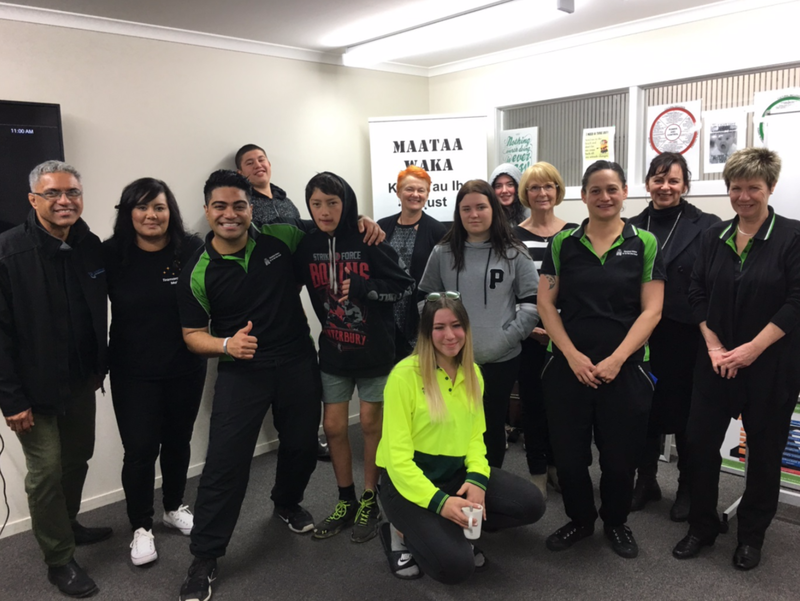 NKMP staff were joined by seven participants on the week-long post-recovery camp as well as a Moana House staff member who stayed for the week to provide extra support. 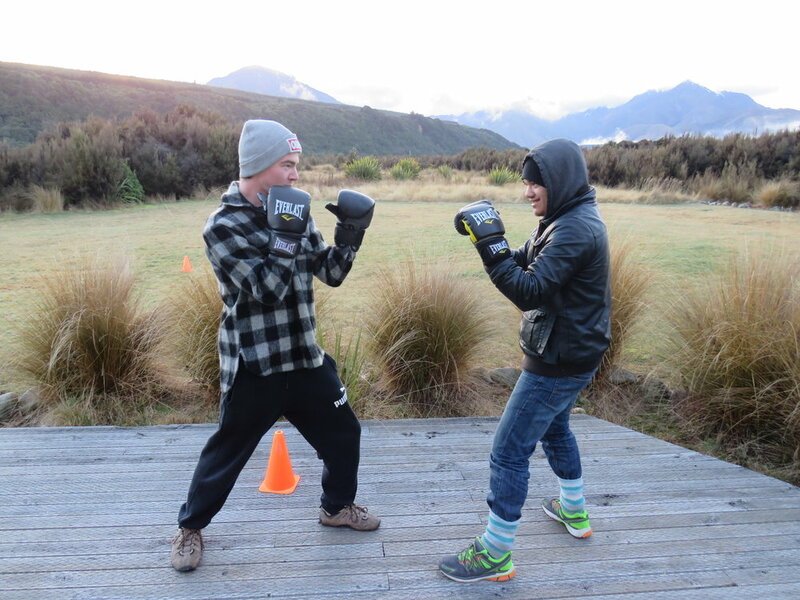 The camp, which was first held in September last year, was developed by Nga Kete’s Addiction Services team and supports exercise, self-expression and wellbeing. Addictions Manager and camp organizer Pikihuia Ruffell said the camp-goers enjoyed physical activities and tasks including daily fitness, tramping, waka ama, and environmental awareness. Highlights of the camp included the waka ama, creating Tukutuku panels, and a 10km walk on the Kepler Track. Tukutuku panels are a modern take on a traditional Maori art work using raffia paper and peg board. They were an amazing way to wind down after some physically challenging days, she said. The panels will be donated to various organisations at a later date. All of the participants said they would strongly recommend the camp and described it as well facilitated, and held in a great venue with fun activities. Some said they developed life-long friends and others said the camp was life-changing. The next camp will be held early next year. If you or someone you know may be interested give us a call on (03) 214 5260. 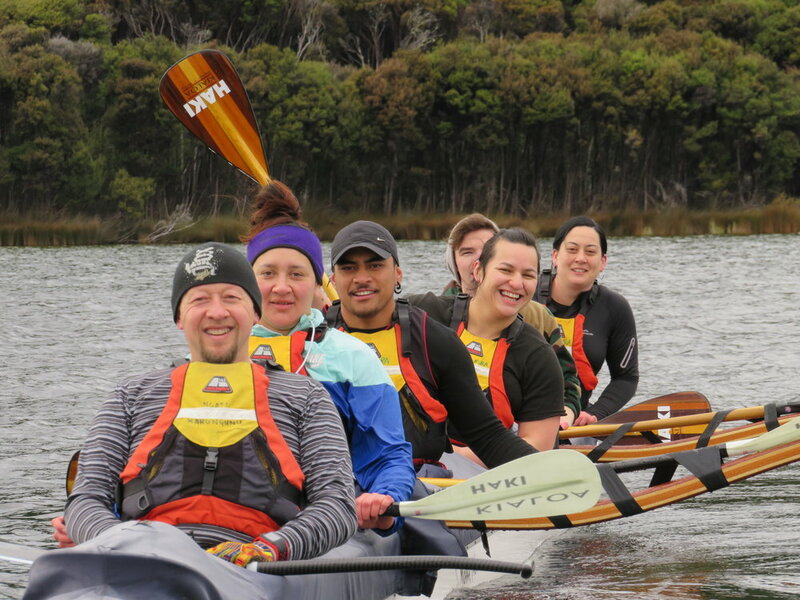 At the other end of the island, I had a fabulous day with the Maataa Waka team as we shared stories about the pounamu trails the rangatahi had been on, as part of the focus on building self-esteem, confidence and courage to take on whatever life puts in our way. Declan Basher told about how his time on the river had enabled him to see life through a different lens; and had given him the opportunity to feel optimistic about his future. Kaitlin Taylor is hoping to compete in the Eastern States speedway competition this season and was so appreciative of the support Te Pūtahitanga o Te Waipounamu has provided. Participating in speedway is a huge part of Kaitlin’s PATH plan. It is important to her because she has been diagnosed with Guillain–Barré syndrome (GBS) in which the body’s immune system attacks the nervous system. Our contract advisors have been busy travelling around all of our entities, supporting them to look at the performance measures, while also preparing for Wave 7 which closes next week on 29 September. Meanwhile I had a wonderful time in Seddon and Ward meeting with two of our local entities. It was great to catch up with Ricky and Savannah Māua of Seddon. When the earthquake hit, it really affected the whānau. After Ricky competed his Forestry Certificate, he realized his dream was to start his own firewood business, Tokorakau. This initiative is for equipment and employment opportunities, to develop a pensioners’ pack so the kaumātua and kuia don’t have to chop their wood. As you can see even the tamariki are equipped with a toy chainsaw to do their bit! 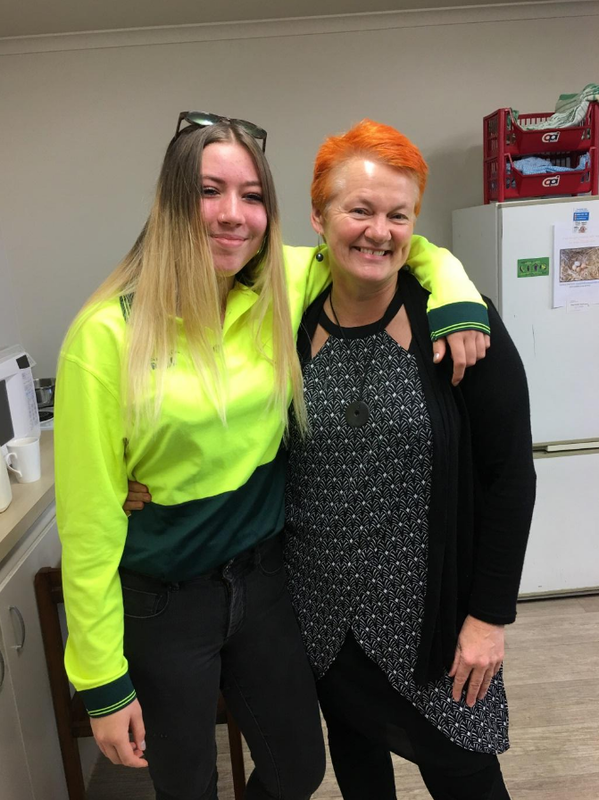 Haydon and Jody Edwards of Ward are setting up a caravan to have rollout at Clarence, close to the workers involved in the road reconstruction; and then in the wider Marlborough area. The Kai Shack is going to be a dream come true for this energetic young mum! But you know in Te Pūtahitanga o Te Waipounamu we try to share the fun around. A couple of weeks ago half our team disappeared to be groupies for Steven Adams. This week it was the turn of our executive assistant, Juli Tyler. Juli attended a conference in Auckland where she got a chance to rub shoulders with Dominic Bowden who is best known as the host of New Zealand reality series including New Zealand Idol, Dancing With The Stars New Zealand and The X Factor New Zealand. She looks pretty chuffed to be in the photo with him – mind you Dominic looks pretty excited too!! And just to finish off the week, we are always happy to be with our Board directors and iwi partners. On Thursday, Te Runanga o Ngai Tahu hosted Judge Andrew Becroft, the Children’s Commissioner for New Zealand, Te Kaikomihana mo nga Tamariki o Aotearoa. Judge Becroft’s presentation was entitled ‘A second chance for a revolution’ (to whakamana our tamariki Maori affected by the care and protection and youth justice systems). As we approach the General Election this weekend it was timely to remember that 1, 123, 000 (23% of the population) are young people under the age of 18 years old: without a vote and without a voice. He shared an example from Regenerate Christchurch of the advantages when children have a say: they have more imagination, they see more possibilities. How will the decision affect children? What are the different impacts? What do children say? and how do we hear them? Use the answers; how will you make a decision? Factoring in children voices along with the views of others. Oraka General Manager, Dr Hana O’Regan; with Taumata member for Ngai Tahu, Jo Mclean, Judge Becroft, and Ngai Tahu Chief Executive Officer, Arihia Bennett. And just to keep us all honest : Diamond, (shining bright like a diamond too she was!). And finally, we are delighted to congratulate GPL member, Glenice Paine, for being appointed as Deputy Commissioner in the Environment Court. Whāia te mātauranga he oranga mō koutou.